1) You wouldn’t be asking about FM radio. Seriously, what does that even mean? Sirius radio is not FM. Your boat has an FM antenna. As the poster stated above. Ready does not mean equipped. What email address did you send the email to? They have always been receptive and answered any email I have sent. I'm pretty sure that many here would say the same. Perhaps you are one of those that expect an immediate reply from a company that literally has thousands of emails and phone calls every week from people from the beginning of production all the way to the current product. Shopping for a new boat in 19? With your 1st post it would probably be best that you "fire the customer" yourself. With a 1st post like that I'd say you must be an absolute joy. How does one spend 170k on a 24MXZ? Other than paying MSRP and you would have to be pretty "special" to do that. Really? 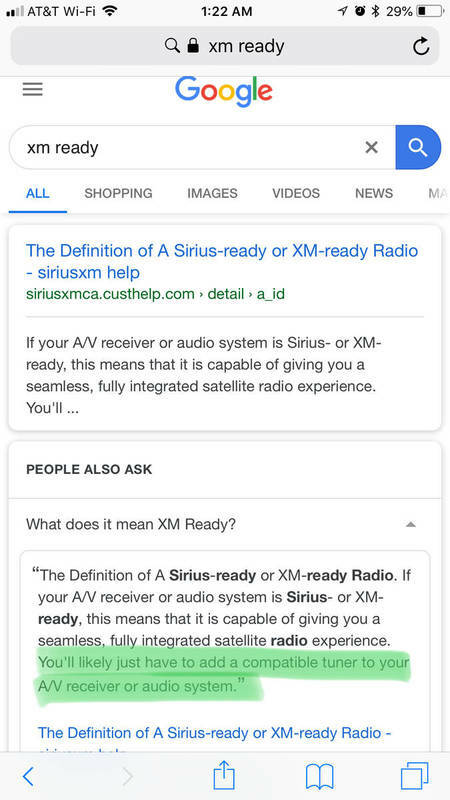 Its 2018 and you dont know what "SXM Ready" means?? And there is an FM antenna. FM is never stellar on boats as you have no vertical. The sxv300 (satellite radio) add on takes 10 minutes to put in and can be had for less than 70$. Seems like easy fix. You could come pretty close with a G4 tower, the 575 engine and bow thruster options. He seems to have a trend of Malibu negativity in my observations. That is as ridiculous as someone finding the perfect girl and dumping her because she doesn't wear earrings. That's what I love about this site. Every once in awhile we'll confuse stupidity or entitlement for trolling but there's such a low tolerance for all 3 that it all works out fine. I think he just raised being a total douche to a whole new level. You guys are horrible. This poor guy just bought a $170k boat, he is entitled to some sympathy. I think this is one of those times where the OP thought that brand bashing on the internet was going to give him the leverage with the dealer or the manufacturer that he wanted. I don’t think he knew his audience. Personally, I can’t wait to see his new thread when he finds all of his “extras” in the bildge. You guys are horrible. This poor guy just bought a $170k boat he is entitled to some sympathy. In his imaginary boat? I’ve found zero in my 2019. I’ve found zero in my 2019. Is that a new option for the 2019’s ???? I'm not sure that he will be back, at least with that name. He hasn't been back since he dropped that post here. Hit & Run.